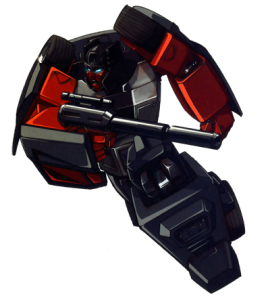 Abilities: Wildrider can reach 250 mph in car mode, and has amazing maneuverability. 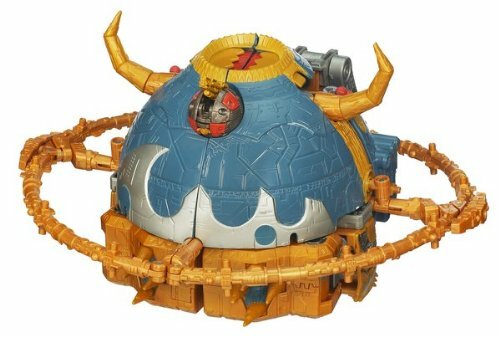 In robot mode, he uses a scattershot gun, which can spray a fifty-square yard area with searing, ripping laser beams at a distance of 1/4 mile. With it, he can de-molish a small 5-story building in two minutes. 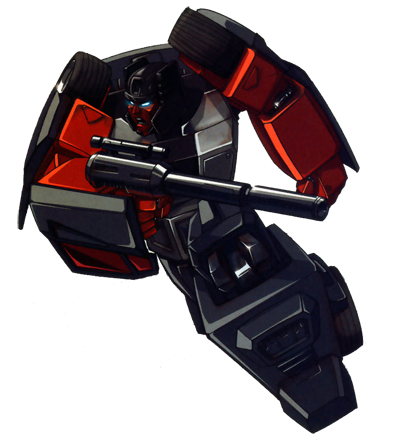 He combines with his fellow Stunticons to form the giant robot Menasor. Weaknesses: Wildrider fears quiet. He suspects enemies are lurking, ready to pounce on him, if all he hears are the sounds he produces himself. This gets him very ‘nervous and hampers his effectiveness. In car mode, he is prone to tire blow-outs due to the crazy way he drives.